- Air velocity: 0.9 to 35.0 m/s, ft/min., km/h, mile/h, knots. - Barometer: 10 to 1100 hPa, mmHg, inHg. - Humidity: 10% to 95% RH, Dew. Display Type: 18mm (0.7") LCD (Liquid Crystal Display), 3 1/2 digits. We have carved a niche amongst the most trusted names in this business, involved in presenting Digital Anemometer. This Digital Anemometer is designed by using sharp edge technology and quality. Furthermore, it is checked for quality under various set norms of the industry. 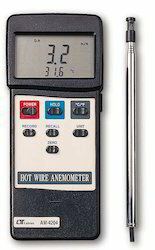 Being a well-distinguished company in the market, we are into offering Digital Thermometer Anemometer. With years of knowledge in this domain, we have engraved a forte for ourselves, in presenting a wide assortment of Digital Anemometer.